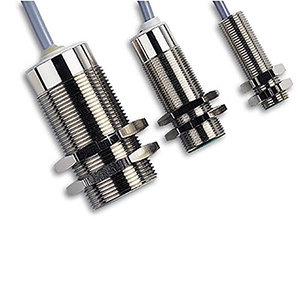 Non-contact linear sensors have an analog output that is proportional to the damping target distance. Their compact yet sturdy design makes them well-suited for industrial, robotics and laboratory use. These sensors utilize inductive technology, which means they are capable of sensing any metal target. The sensing distance, however, is influenced by the metal target. Ranges are calibrated using a standard square target. The target is mild steel (Fe 360), 1 mm (0.04") thick. The side lengths are the larger of either the sensor’s face diaphragm or three times the sensing distance.